"Damage to USS Yorktown CV5"
The USS Yorktown was the only ship attacked during the Battle of Midway. Two air strikes from Hiryu found Task Force 17 on June 4th. The first was 18 dive bombers escorted by 6 fighters which found the Yorktown at approximately noon. The second attack consisting of 10 torpedo bombers escorted by 6 fighters found the Yorktown just before 2pm. The Yorktown was hit by three bombs and two torpedoes from these attacks. 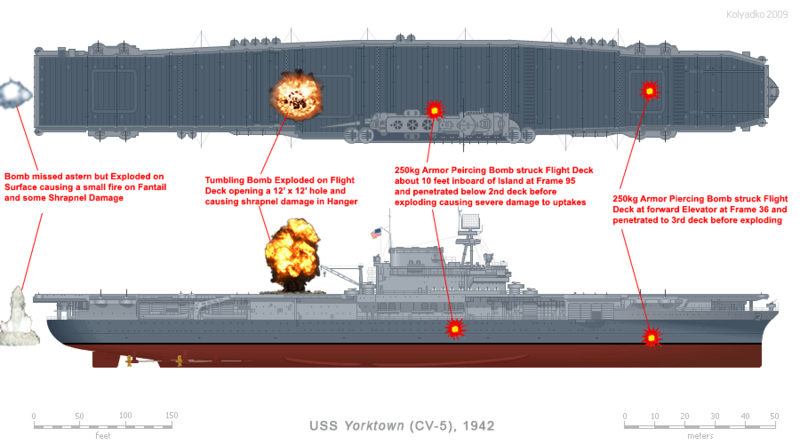 Below is a visual representation of the hits and damage Yorktown suffered. Despite the two attacks and the subsequent abandonment of Yorktown shortly after the second attack she did not sink. Captain Buckmaster and other volunteers returned to Yorktown to try to salvage the ship after it became apparent she would not capsize and sink despite a list of 26 degrees. Salvage operations continued until June 6th when the IJN submarine I-168 found the Yorktown and put two more torpedoes into the hull. Yorktown was abandoned a second time but did not sink until the following morning June 7th. The Yorktown suffered three bomb hits and 4 torpedoes before succumbing. But no assessment of the battle damage would be complete without considering the damage she suffered at the Battle of Coral Sea a month earlier which was not completely repaired by the time of the battle. So we start there. The above image represents the three bombs that cause damage to the Yorktown during the Battle of Coral Sea. One 250kg bomb struck the ship and detonated just below the third deck causing considerable damage and even causing the abandonment of three boiler rooms as punctures of the air intakes caused smoke to be sucked back into the boiler rooms. The bomb hit the flight deck at frame 108 slightly to the starboard side near the aft end of the Island. It penetrated the flight deck, the galley deck, hanger deck, decks one and two before hitting the bulkhead of the forward engine room access trunk, which slowed it's decent considerably. It then deflected slightly inward penetrating the third deck and exploded just before reaching the fourth deck and right above the forward engine room aproximately between frames 107 and 108. The fourth deck was armored and was dished in but not penetrated by the bomb or shrapnel thus protecting the engine room. The damage from the bomb destroyed the ship's service store, soda fountain, laundry issue room, ship's service office, and engineer's office as it blew upward through the thinner decks above. Below is the official damage report indicating the damage from the hit. Two other bombs also caused damage to the Yorktown. One bomb hit a glancing blow to the Gallery Walkway just forward of the anti-aircraft mount but did not explode until it hit the water about 50 feet to starboard causing shrapnel damage and a damage to the walkway. The more serious near miss occured to port. The bomb landed about 20 feet from the ship and exploded underwater. Damage from the near miss caused significant leaks in some of the oil tanks. In addition some hull plates were bend inwards from the blast causing at least some structural damage. A month later one of the Japanese aerial torpedoes would strike the Yorktown not far from this near miss. Although none of the damage was serious enough to hinder her combat effectiveness it did leave an oil slick. Fletcher had been criticized for retiring from the battle but it is hard to image continuing when you know the Japanese still had one undamaged carrier and you have a giant arrow pointing to your only remaining carrier. Unjustified as it was it would be one of many criticisms of Fletcher that would haunt him for most of 1942 till he was replaced after the Battle of Eastern Solomons. The Hiryu launched 18 Val dive bombers escorted by 6 Zero fighters as soon as they were ready. They picked up some stragglers from the morning attack on Kidi Butai returning to the American Carriers and found Yorktown at about noon. Cap from Yorktown intercepted the Japanese attack about 20 miles out shooting down about 10 or 11 Val's. The remaining Val's pressed home their attack. One bomb hit amidships not far from where the bomb hit at Coral Sea, piercing the flight deck and exploded in the lower part of the funnel. It ruptured the uptakes for three boilers, disabled two boilers, and extinguished the fires in five boilers. Smoke and gases began filling firerooms in five of the six boilers. The men at number one boiler remained at their post maintaining enough steam pressure to allow the auxiliary steam systems to function. Another bomb hit the carrier from the starboard side on or near the number one elevator, piercing the flight deck, and eventually exploding on the fourth deck. This started a persistent fire in the rag storage space, adjacent to the forward gasoline stowage and the magazines. The third bomb hit aft of the number two elevator and exploded on contact. Sources say the Val that dived on Yorktown was hit by anti-aircraft fire just as it released and the bomb tumbled in flight from the aircraft. Whatever the case it tore about a 12 foot hole in the flight deck. Fragments pierced the flight deck and hit three planes on the hangar deck which started fires. One Dauntless was fully fueled and armed with a 1,000 pound bomb. Lt. A. C. Emerson, the hangar deck officer, activated the sprinkler system and quickly extinguishing the fires preventing a near disaster. Yorktown slowed to a stop shortly after the attack but eventually four of the six boilers were fired again and the ship began to pick up speed until she reached about 20 knots. The flight deck was repaired and further repairs were being made below decks and flight operations were resumed. However shortly before 2pm another flight was detected about 35 miles out on an intercept course. These were the 10 Kate's and 6 Zero's of Hiryu's second attack. Hiryu's torpedo squadron was hard hit on the morning attack on Midway Island. Only 9 of her 18 Kate's were serviceable after the attack. One orphan from the Akagi that was assigned to the morning search landed on Hiryu upon returning as Akagi was on fire and unable to operate aircraft. Therefor only 10 Kate's could be launched for the follow up strike. Yorktown sent CAP to intercept the Japanese strike and launched the remaining fighters in the process of refueling on deck. Some did not have much fuel but all 10 got off before the attack. The torpedo planes split into two groups of five approaching Yorktown in a classic Anvil attack. One group lead by Lt. Joishi Tomonaga attacked from the starboard side. Tomanaga's Kate had one wing tank damaged in the morning attack on Midway and did not have enough fuel to return. However this group ran into the Yorktown's CAP and three were shot down before they could make their attack. Two managed to launch torpedoes but were shot down before they could escape. One was Lt. Tomonaga's Kate that dipped a wingtip into the sea immediately after launching and disintegrated on impact. As Yorktown maneuvered to avoid these torpedoes another attack which appears to have been completely ignored by the CAP attacked from the port side. This attack was positioned nearly perfectly as Yorktown could not turn in time to avoid the attack after avoiding the torpedoes from the starboard attack. The second group of Hiryu's Kate's included the one orphan from Akagi who's release mechanism did not work. Only four torpedoes were subsequently dropped but two struck the Yorktown at nearly the same place amidships close to where the one of the bombs hit in the earlier attack by the Val's and again where the one near miss landed during the Battle of Coral Sea. All five of these Kate's escaped to return to Hiryu although all but one was damaged and would have to be repaired before participating in further attacks. The two torpedoes blew out the fires in all the boilers and Yorktown slowed to as top dead in the water and began to list to port. Soon the list increased to 26 degrees and she was ordered abandoned as it was feared she would capsize. But Yorktown did not sink. By late afternoon of the 5th plans were being made to try to salvage the ship and on the 6th a party was landed and proceeded to attempt the salvage. The Destroyer Hammonn came along side to provide power and by the afternoon the list had been improved by pumping water out of flooded compartments and heavy equipment having been shoved overboard. By afternoon the Yorktown was being towed by the Tug Vireo and operations were succeeding. A scout from the cruiser Chikuma spotted the dead in the water Yorktown on June 5th early in the morning. Later that morning I-168 picked up the message to find and sink the American Carrier. On the morning of the 6th I-168 spots Yorktown and proceeds to maneuver into an attack position. Early in the afternoon on the 6th I-168 fires four torpedoes from a range of 1200 yards. One hits Hammonn and two run under the Hammonn and hit Yorktown on the starboard side directly opposite from the two aerial torpedo hits on the 4th. The fourth torpedo misses astern. 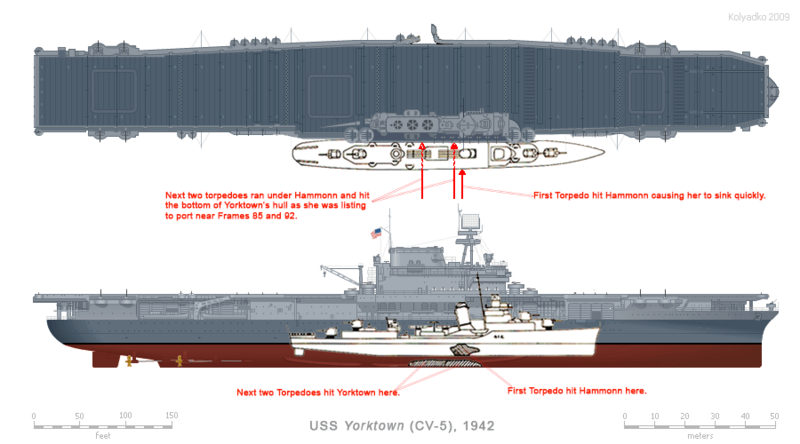 Yorktown remained afloat throughout the 6th and through the night but early on the morning of the 7th she finally listed heavily to port and rolled over and sank. An end to a gallant ship. 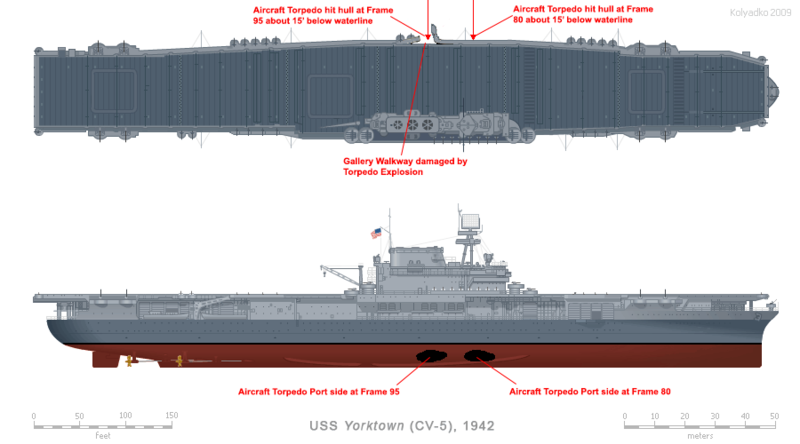 The illustration above shows the relative position of the torpedoes that hit the Yorktown from the I-168. However as the ship was listing the torpedoes actually struck the underside of the hull. Below is a drawing to show the true points of impact. One of the things that has always amazed me is just how much punishment the Yorktown received before finally succumbing to her wounds. 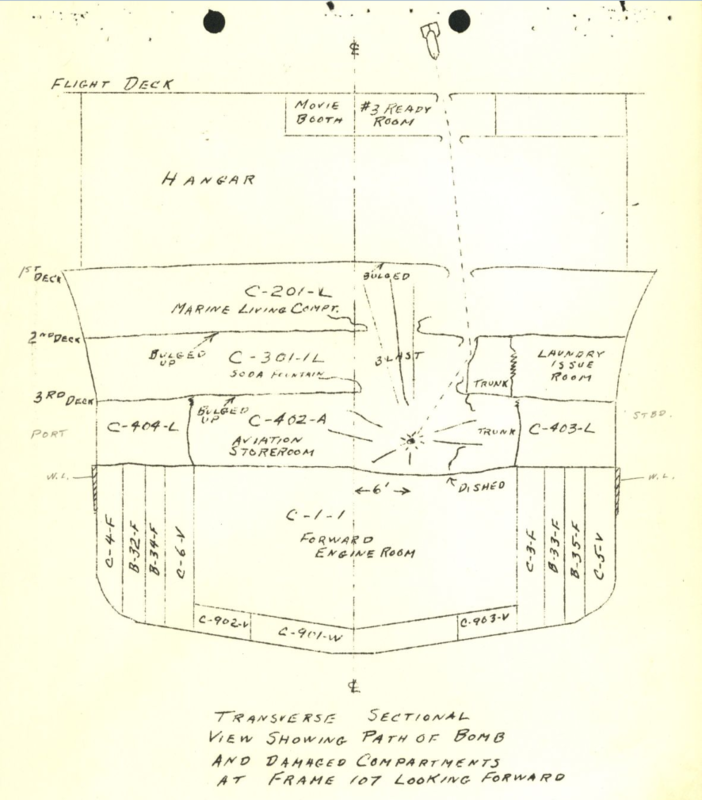 Counting the one direct bomb hit amidships and the near miss to port both received at Coral Sea the Yorktown took a total of 3 bombs and 4 torpedoes between frames 80 and 108 and still remained afloat, a testimony indeed of the workmanship of the US builders. One of the reasons I included the damage at Coral Sea is because it was really never properly repaired, especially the bomb hit amidships. Much of the decks damaged were not even covered up except possibly later by plywood and only to keep sailors from falling through the open holes in the deck. The watertight integrity of this area of the ship must have been compromised considerably and yet Yorktown received another bomb hit and 4 torpedoes in approximately the same area. One wonders given how long the ship remained afloat after the Battle how much of her demise was due to the incomplete repairs from the damage received a month earlier. 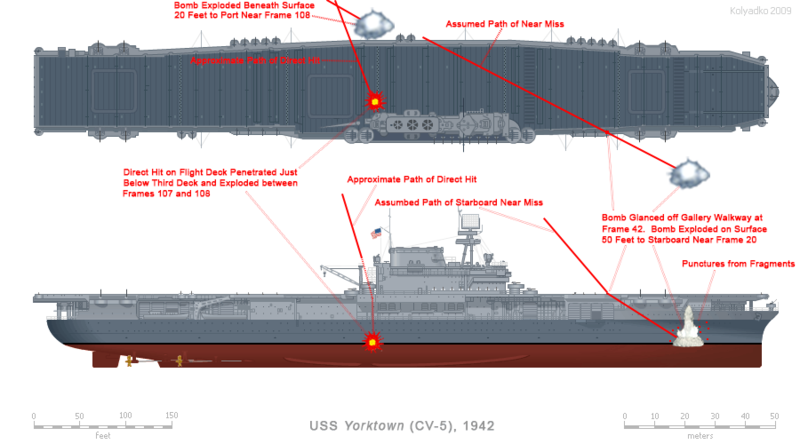 Information for the damage to Yorktown at both Midway and Coral Sea taken from official after action reports as well as many books and articles collected over the years. Mr. Carra's excellent summary of the Yorktown's damage from the Battle of Coral Sea on his blog at http://wonderduck.mu.nu/beginning_the_miracle was also most beneficial and goes into more details about the bomb damage sustained at Coral Sea.